Just like any other evening, I was tooling around on Facebook instead of doing my homework,. On the night of Oct. 30, however, my mind was blown by a post from NPR I thought could only happen in a galaxy far, far away: Disney bought Lucasfilm and Star Wars for $4 billion. I stared in disbelief as thoughts of confusion rattled my brain. It did not surprise me someone had bought Lucasfilm. George Lucas had always been a Hollywood outsider, and he had made it clear he was not going to make Episodes VII, VIII and IX. It seemed like only a matter of time before Lucas washed his hands and sold his legacy, allowing him to move on after all the years of clashes with a demanding fan base and critical Hollywood insiders. But Disney? I thought any other film studio would buy Lucasfilm before Disney. At first, I feared that Disney might neuter Star Wars and turn it into another one of its cookie-cutter fairy tales. But I realized these fears were unwarranted. The change will hopefully not be horrible for the franchise. It’s not like Episodes I, II and III were the best Star Wars movies. But then again, they were nowhere near the absolute waste of celluloid that was John Carter, Disney’s recent attempt at sci-fi. Disney announced Lucas would stay on as a creative consultant, but it still begs the question, “Where does the story go from here?” Disney announced it will release Episode VII in 2015 and VIII and IX in the following four to six years, but where does the story go? The logical answer would be to continue where it left off, except Lucas never extended the story beyond Episode VI and the final redemption of his tragic hero. There is a variety of storylines that could be adapted from the myriad of Star Wars books out there, but recycling an old storyline seems unlikely. The old Star Wars movies hold a special place in my childhood I do not want ruined. Pretending to use the Force and defeating the Empire are memories created by the magic of a man, a vision and small film studio that defied the Hollywood bigwigs. The future of one of my favorite movie franchise and one of the cornerstones of nerd culture is up in the air. 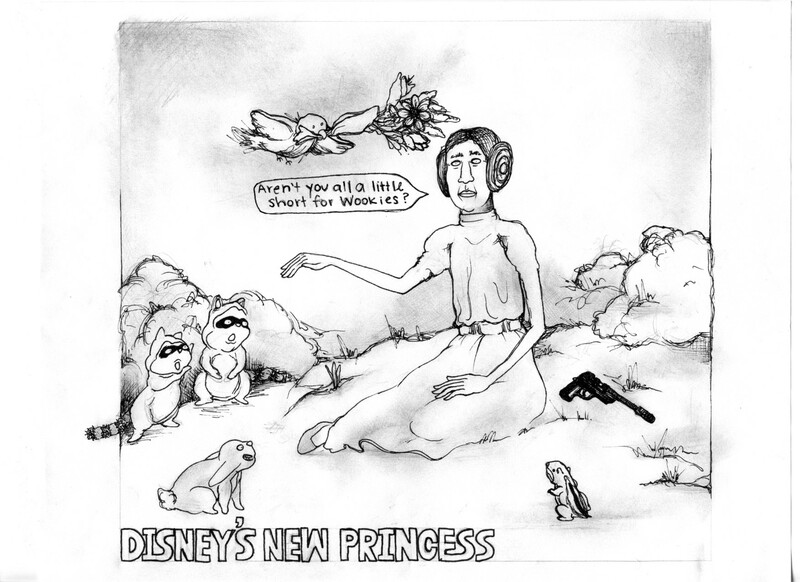 But no matter what comes of the future of Star Wars, I can at least say one thing from now on: Princess Leia is my favorite Disney princess.